Allergy Alert! 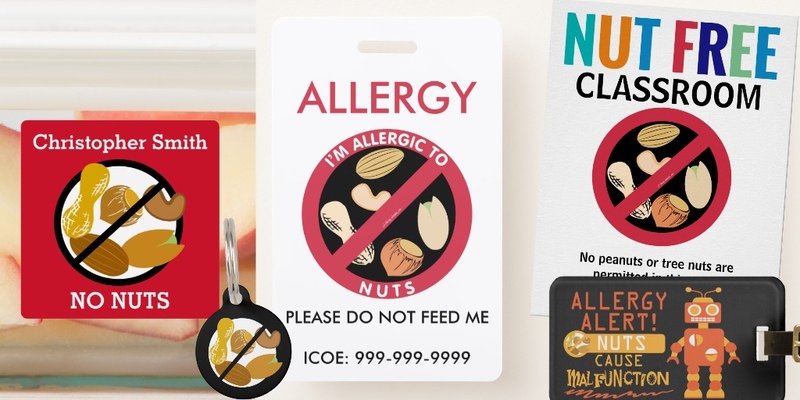 Tree nut and peanut allergy alert signs and warning symbols available on posters, shirts, stickers, and kitchen items. All items can be personalized with a name or left blank with no name. Red bold warning labels help identify the allergen to be avoided with pictures of a variety of tree nuts and peanuts. Shop our online store through Zazzle to order food allergy and awareness items. We offer a variety of items useful for alerting to food allergies and raising food allergy awareness. Keychains, stickers, buttons, lunch boxes, water bottles, and stickers are all available in a variety of styles. There are more than 100 varieties of shirts to choose from ranging from infant, toddler, child and adult size. Shirts can be ordered as long sleeve, short sleeve, sweatshirt, or hoodies and come in a variety of color choices. Our items help raise food allergy awareness as well as act as a reminder to caregivers of food allergies. Stickers are great to attach to medicine kits, lunch boxes, school paperwork, daycare supplies or for young nonverbal kids to wear. Edit the text to personalize the text. They are available in small or large sizes, scratch-resistant front, easy peel-and-stick back in a matte or glossy finish. Keychains, luggage-style tags and buttons are great for labeling medicine kits, bookbags or other items. Put tree nut and peanut free snacks for daycare or school in a tote bag personalized with a name! Cute tree nut and peanut allergy lunchboxes can store snacks or medicine. Keep your child’s drink safe from accidental sharing by personalizing a fun water bottle. Other nut allergy home and dining products include aprons and melamine plates. Posters, acrylic signs, door hangers, and wall decals can all help designate an area to be peanut or nut free. Use these self-inking or rubber stamps to label things as containing nuts or free from nuts. Contact me if you need assistance! Check out our PEANUT allergy alert and TREE NUT allergy alerts.